If your child enjoys crafts then book a place at Mambo Jambos after-school painting class on Wednesday 10th or Friday 12th October from 4-5pm. 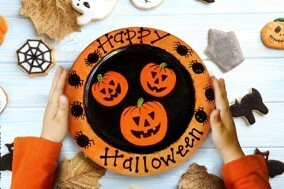 They will learn tracing techniques using paper cutouts, and get to create their very own pumpkin plate! Tickets cost £15 per child, which includes the tuition, decorated pottery piece, materials and refreshments. The class is suitable for children age 7 and over, and their plate will be ready to take home two weeks after the class, just in time for Halloween! Mambo Jambos pottery painting studio is opposite the entrance to Squire’s Garden Centre in Badshot Lea.